The American Legion’s Post 43 in Hollywood recently honored first responders at its annual Law and Order Night celebration. 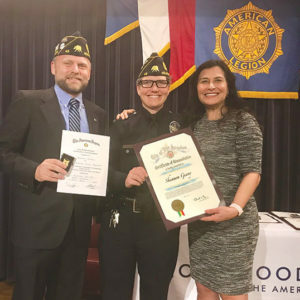 Post Commander Michael Hjelmstad (left) and Nikki Ezhari, district director for Councilman David Ryu, 4th District, presented a proclamation to Sgt. Shannon Geaney, of the LAPD’s Hollywood Division. 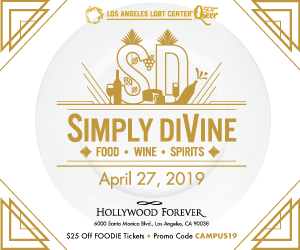 Additional honorees included LAPD Officer Benjamin Thompson, Deputy Sheriff Daniel Martinez, LAFD Firefighter Christopher Dupertuis, CHP Officers Robert Manzano and Jose Barrios, and Officer Bernard Reyes, of the Veteran Affairs Police Department. Post 43 is located at 2035 N. Highland Ave. For information, visit hollywoodpost43.org.